Spiced Savory Waffles are redefining breakfast and snacking at my home in a big way. Spiced savory waffles, the new love of my kids and family. We make them morning or evening with milk or Tea. It rocks with any of your favourite sauces or makes an amazing sandwich filler. Want more! It’s a perfect Kids Tiffin box idea. A super healthy snack and breakfast idea. Crisp and flavorful, spiced with italian herbs and indian spices.The combination makes this waffle a too good to be true snack. Find more amazing Kids Tiffin Box Idea and Quick and easy Breakfast Ideas on the blog.Here are a few links you may try. Easy Lentil Crepes , Beetroot Burgers , Soya Parantha / Soy stuffed flatbreads, Vermicelli Upma, Poha, Tapioca , Daliya . 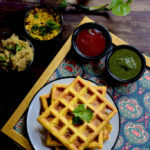 Savory Waffles made with gram flour and semolina. Spiced and flavoured with italian and indian mix. This is a perfect breakfast or an idea snack option which is low fat, vegan and gluten free. For the Batter: Add all the ingredients in a mixing bowl. Start adding water to mix. You need to achieve flowing consistency. Keep adding water till the flowing consistency is achieved. Keep this mixture aside for minimum 2 hours. If you are making these waffles for breakfast next morning, then you may make the mixture the previous night and keep in the refrigerator. Check the consistency in the morning or after 2 hours and add more water if needed. As the semolina soaks the water and the batter may thicken. To cook: Smear the waffle maker with butter or desi ghee nicely.Pour 4 tbsp each batter on both sides. Cook till done. Once the bottom is cooked well, flip the waffles over and cook the other side again.Apply some ghee or oil if needed to cook well. Serve hot with your favorite chutney or make a sandwich with this waffle. A bowl to mix the batter. To make this Vegan, use oil instead of clarified butter or desi ghee. Wow these look amazing. I love the richness and complexities in the flavor of Indian food. This brings those attributes to one of my favorite things, CARBS! What a delicious addition to an appetizer spread. So unique too. Thanks for sharing. Thanks karyl. Do try these. Am sure youll love the flavor. They are vegan and gluten free too. Your savory waffles look so good! I have always struggled with making mine taste great but your recipe gives me hope! Try these. Am sure youll like it. Now you’re talking!! Savory waffles that are spiced up. Oh that sounds so yummy. And the combination of Indian and Italian spices. I wouldn’t need this as a sandwich or anything else. Just hand them over and I’ll munch on them. Love the idea of chickpea waffles! I’ve just made chickpea crepes and were delicious, these waffles are definitely on my next weekend brunch list! Lovely combination of ingredients. These waffles look so good. Can’t wait to try this! I’m admit, most of these ingredients are unfamiliar to me but I’d love to try this recipe and expand my food experiences. I’ve eaten savory crepes a few times before but had never thought about savory waffles and now I’m a little upset. LOL Such a great idea! Loving all of the spices you used! Now this is the kind of waffle that I want to eat with chicken. It would be so much better than the standard sweet waffles. Although I’d still add the syrup! These look seriously amazing! All the ingredients really take the flavor to the next level. Can’t wait to make them. What a great idea for an afterschool snack! I love how healthy and tasty they are, my kids would love to munch on these. These savory waffles are a great way to eat eggless and gluten free too. I often use chickpea flour for pancakes so this would work just the same. Sounds yum. Love the addition of veggies.